My friend Steve Martin (not that Steve Martin) is one of nature's gentlemen. He also wears his heart on his sleeve in a sometimes confusing, but always endearing way. 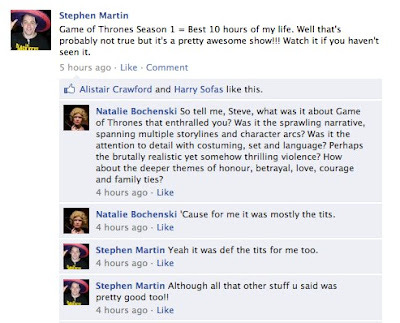 Steve, like many people on Planet Earth, has a deep and abiding love of breasts. He's openly admiring too, incapable of sneaking furtive glances at cleavage when their owner isn't looking. He has such a comically wide-eyed and appreciative way, that I've been known to torture him by telling him firmly "Steve! Do not look at my breasts in this top!" in order to guarantee an immediate glance downwards followed by a forlorn "I'm sorry, I was really trying not to." It's entirely possible Steve is a secret genius who's worked out a way of ogling women without ever getting in trouble. Regardless, I always enjoy Steve's unrelentingly honest Facebook status updates, and chose to exploit him somewhat today. I set 'em up, Steve knocks 'em down. Thanks to Steve for allowing me to re-post this. On another topic - thanks to everyone who suggested names for drunken car-based heckling. They all made me snort like a pig watching Letterman. But after careful consideration, I am going to award the double pass to ImproMafia's Agatha Holmes Ahoy! to Syme, for the simple, efficient and evocative "Alco-Holler". Now when I get yelled at by drunks in a passing cab, I'll turn to my friends, wink, and say "Charming alco-holler, wasn't it?" Syme - if you want to shoot me an email, we can arrange a time for you to come and see the show! wow! that's really a brilliant idea! why didn't i ever think of it! Where is your email Clumsy-girl? That would be in the Contact tab, sir. ahahahaha. steve sounds like someone I know. That was entrapment, Plain and simple.